Failure awaits all leaders who trust the wrong people. Surround yourself with people you can trust. Few things are more powerful than a team of talented people who trust each other. It doesn’t matter what you want to accomplish if you surround yourself with untrustworthy people. #1. Trust people who connect rather than isolate. 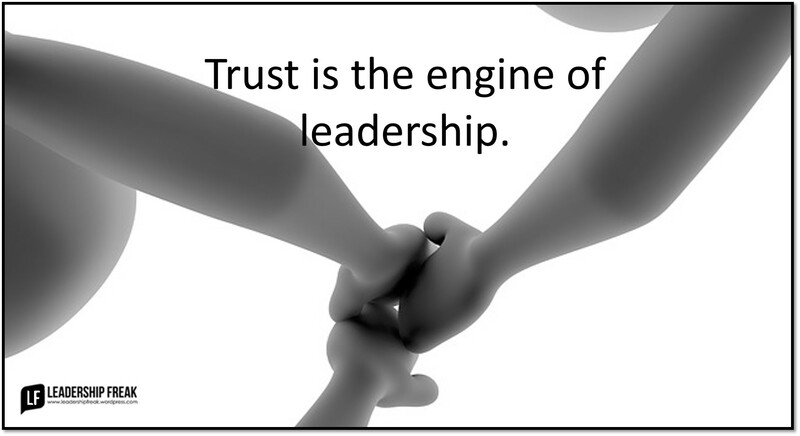 Accept the need for privacy, but trustworthy leadership includes relationship building. People who can’t connect, can’t lead. #2. Trust people who stay supportive after not getting their own way. Beware of team members who cross their arms and pout when they don’t get what they want. #3. Trust people who criticize up and down organizational hierarchy. Don’t trust people who refuse to voice constructive criticism. Don’t trust people who only criticize people who aren’t present. Don’t trust people who shift positions depending on the people around the table. #4. Trust people who express gratitude for colleagues and teammates. People talk about you the way they talk about others. #5. Trust people who disagree kindly and openly. Don’t trust people who raise an eyebrow of disapproval, but don’t openly voice concerns. Manipulators wrinkle their foreheads, but don’t speak up. Beware of people who avoid, deflect, and sweep important issues under the carpet. #6. Trust people who treat powerless people with respect. Do they speak kindly to you and rudely to the server at dinner? It’s possible to have a bad day. What’s the pattern? #7. Trust people who trust others. Delegating, listening, and transparency indicate you have learned to trust others. A person who can’t trust others can’t lead. Bonus: Trustworthy people tell you what they really want. How do you spot people you can trust? Dan excellent subject and a great focused post. I have found whether its choosing Work Teammates or Close Friends the three most important traits are people who you: Like, Trust and Respect. It is often hard to find all three but it pays off in the end! Thanks Brad. “Like-trust-respect” … looks like the trinity of strong relationships! Great stuff. I needed to hear this. When that happens you can be sure you are not the only person being baited. Swim away, no trust there. Thanks dotyman1. Your comment reminds me of a manipulator who told me that he lowered the volume of his voice to the point where people had to lean in to hear him. Ugh!! There is a subset also who often criticize, in very general terms, without names. Drop a comment or hint or two designed to ignite doubt and suspicion. Start that fire. When pressed for more detail they rarely offer any. “I can’t say” might be a response. They are baiters. Bait the hook and reel you in. One thing they seem intent on doing is letting you know in no uncertain terms, they know more than you. If you have been baited, others have as well. Thanks Will. You’re making me think about the classic strategy of backstabbers. They bait you to talk bad about someone else and then use it against you. We shouldn’t take the bait in the first place, but when we do, it comes back to bite us. Good stuff. I look for behavioral stuff we can add into the new Buccaneer team building game that is in its final constructions. These are always helpful. Thanks. Solid thinking as usual. There are lots of links to the themes of team performance, too. Thanks Dr. Scott. If you have to choose between words and behaviors, choose the latter. Thanks for adding the dimension of team building/team performance. Thank you Dan, great value here..
Great post as usual Dan- No.1 and No.4 really resonated for me in the work environment at present. Long ago, I had a supervisor who pulled me – the new guy- aside and asked, “What are the other guys on the team saying about me?” I was stunned by the question and finally told him I hadn’t heard anyone say anything about him. I later asked another team member about it and was told that this was a common tactic this supervisor used, asking everyone the same question privately and apparently expecting team members to tell him if anyone else was bad-mouthing him. This team member said everyone always replied that everybody was saying they loved their jobs and loved working for him. This seemed to satisfy him, I was told. I used the same answer the next time he asked me, and then thankfully he was soon moved to another assignment until he retired a few months later. I think of this incident whenever I think about supervisors creating trust issues within a team. Thanks Jim. Your comment makes me think that covering our fear causes distrust in others. Your supervisor was afraid that others were talking bad about him…his behavior reflected fear. It made you and your team members lose trust in him. thanks for something to think about. I’ve had a few “bosses” in my life. I consider myself a trustworthy person because that’s just who I am, but reading your post today lead me to think about it from the opposite perspective. How can one know if the boss is trustworthy? My current mentor / boss actively invests in me, my future and my success, even when it’s not convenient. For that, he has earned my trust and therefore, I will always do whatever I can to earn / keep his. His example has been the perfect example for me as I consider how to lead my team. Good stuff, Dan…thank you again. How do I trust leaders that cannot deliver and does not have the time of day to listen. Sigh. Great post! I work with a person that I don’t trust at all, for a lot of the reasons you describe. Problem is, I need them. I need to work with them on various projects, as they are an integral part of our team. I guard myself and my words when interacting with this individual. Thanks Dan, great article. I found these criteria as easy to apply to me – what I can do to be more trustworthy and trusting. It boils down to two things; Am I safe with you? and Can I count on you? If we can answer those two questions every day in every interaction, we will build trust.